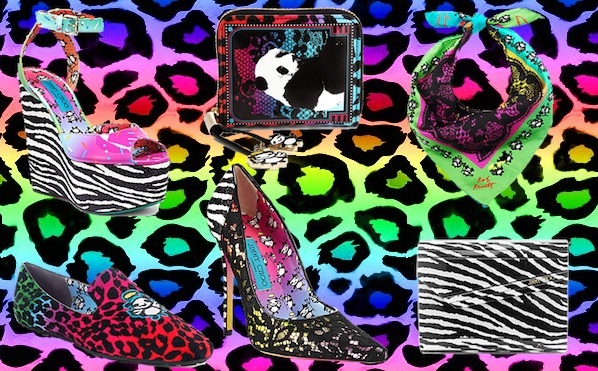 ♥ Sweet Glamour Makeup ♥: FASHION CRAVE: JIMMY CHOO FOR ROB PRUITT COLLECTION! 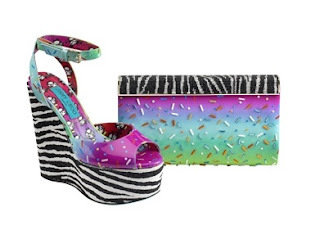 FASHION CRAVE: JIMMY CHOO FOR ROB PRUITT COLLECTION! I received an exciting little package the other day..
A packet of catalogs featuring the new Jimmy Choo collection for Rob Pruitt..
And I almost had a panic attack from all the gorgeousness! 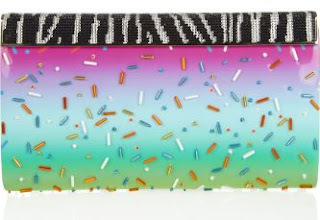 Why Choo,must you tease me and my obsession for candy,sprinkles,pink and zebra? WHY?! 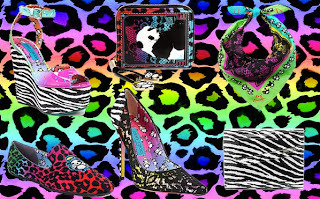 Its invokes memories of my Lisa Frank notepads,stickers..which clearly was an addiction back then. You can shop the collection at Jimmy Choo! The smaller panda wallet,the Nicolino,retails for $625 and has definitely caught my eye. The sprinkle shoes will set you back a whopping $1095,very cute and snooki like. Sadly,I could only dream of having it all! The price point is what you'd expect I suppose from a high end designer;you get what you pay for! What are your thoughts on this colourful products? Will you be indulging in this collection?